What can we do to allay global warming, contend with world hunger, be healthier, and live longer? In The Compassionate Diet, Nature's Path founder and CEO Arran Stephens, who has been at the leading edge of the organic food movement for decades and a vegetarian his entire adult life, answers these complex questions in the simplest terms: Eat vegetarian. A balanced and natural vegetarian diet is neither a fad nor a passing trend. It has been part of many cultures over untold millennia. 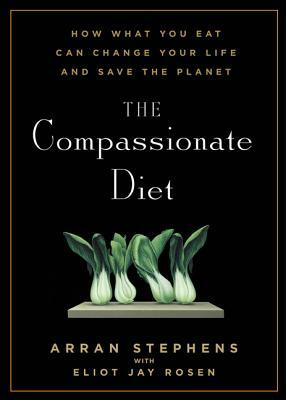 The Compassionate Diet distills the history, philosophy, and core benefits of eschewing meat. A sense of compassion and humanity has animated Stephens's life's work, and it drives this book. The vegetarian lifestyle has innumerable benefits, but for Stephens, eating a plant-based diet is first and foremost an expression of compassion for animals, for ourselves, and for the planet. This elegant and completely approachable book is a beautiful guide that illustrates the rich gifts that compassion yields. Arran Stephens and his wife are the founders of Nature's Path Organic Foods, North America's largest organic breakfast foods company. He has received Ernst & Young's Entrepreneur of the Year and the Canadian Health Food Association's Hall of Fame awards and has been named among Canada's Best 100 Employers. He lives with his family in Vancouver. Eliot Jay Rosen is a clinical psychotherapist and health writer based in Hawaii. He is the author of the Los Angeles Times bestselling book Experiencing the Soul.